After market LED lights. Legal UK? #21 Re: After market LED lights. Legal UK? I’ve been looking at LED bulbs to replace the halogen H4s I currently use. None of the available units have a well defined dip cutoff. Most are simply dimmer on dip than main. They will be very bright but they will also dazzle. #22 Re: After market LED lights. Legal UK? Here is my take.....the road vehicles regulations 1989 are not retrospective - our cars were built long before they came in so there is no reason from a wattage point of view. All cars post 1980 something must use E marked bulbs but there was no such thing as an E marked bulb in 1970..technically our cars are not required to have E marked bulbs. Regulations are rarely retrospective.... HOWEVER..the very first edition of the lighting regulations goes back to the 1930's where it states that cars should have a means, electrical or mechanical - yes mechanical!, to ensure head lights can be adjusted so as not to dazzle on coming motorists/road users....or words to that effect. So what ever bulbs we use we must not dazzle on coming road users. The combination of bulb and reflector in a 5 inch round lamp unit has been very carefully designed so that in dipped mode the shield around the dip filament in combination with the reflector geometry ensures correct beam cut off and appropriate direction of the beam for LHD or RHD as appropriate. The reflector is designed for a filament bulb with a light source comprising the length of the filament (around 5 mm) and its location in the bulb and a correctly sited shield (it has a special name which escapes me for now). Any LED replacement must mimic the filament to work correctly with the reflector in order to provide the correct cut off in order to comply with the anti dazzle as described above which our cars ARE reqired to comply with. Most cheap LED H4 bulbs just have from 3 or 4 to many small LED elements spread along the length of the "bulb". Dip is provided by either dimming or switch some off. There is NO WAY they will provide the correct cut off. In the very small print they usually say "for off road use only" .There are some very expensive bulbs that seem to have single LED elements for the main and dipped mode and MAY work. However they may not. Added to this they have huge heat sinks behind the bulb which either simply wont fit behind an e type reflector designed for a standard bulb, or if they do, heat loss from the bulb will be so impaired that the bulb will fail rapidly. They also have a driver module in the wire for the bulb that has to go somewhere too. So for both legal and practical reasons it is my view that LED bulbs should NOT replace the traditional filament bulbs for the head lights for now. However replacing all the other bulbs with LED versions is fine. The regulations do not prohibit us from so doing. I have done it on my car. This applies here in the UK - other juristictions will be different. As an aside even halogen bulbs vary significantly and the cheap crap ones on Fleabay won't produce a correct pattern either. Buy quality bulbs from Osram or Philips or Bosch etc and enjoy happy dazzle free motoring. And it IS illegal to fit HID bulbs to E types as our light are not self levelling and HID bulbs can ONLY be fitted in lamp assemblies that are self levelling. My thoughs only - others may think differently of course. #23 Re: After market LED lights. Legal UK? All very good Julian except for your assertion that the regulations are not retrospective and maybe they are not actually. If you look to the link I gave, scroll down to Schedule 4 or 5, go there and look to paragraph 8(c) it specifies that all vehicles with 4 or more wheels manufactured before 1st April 1986 shall have dipped or main bulbs with a minimum wattage of 30W. This is likely carried over from the original 1930's legislation. #24 Re: After market LED lights. Legal UK? Anyone else remember 75watt sealed beam units? #25 Re: After market LED lights. Legal UK? #26 Re: After market LED lights. Legal UK? #27 Re: After market LED lights. Legal UK? I noticed in the supplement with this months Classic Jaguar there was an advert from Wipac. 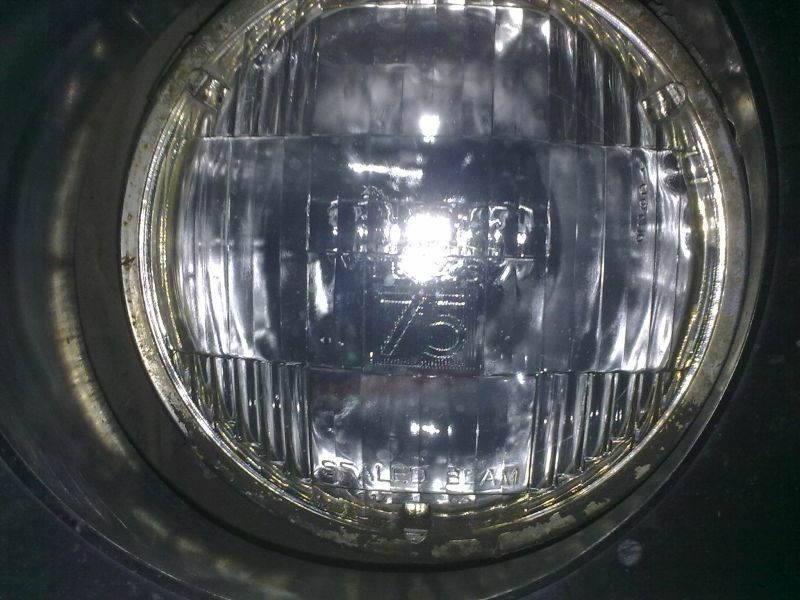 The Brand New Exclusive 7" LED Headlight. available from all Wipac distributors. I know the Wipac H4 units had some favourable reviews before. Perhaps these are a possible avenue to explore for those wishing to take this path. For me, the Osram H4s have been perfectly good for night driving even without the relay upgrade. #28 Re: After market LED lights. Legal UK? There are a number of offerings of whole headlamps with LED “bulbs” for sale for Jaguars and Landies in the range of £200 - £400. Similar offerings (at least visually in the adverts) for Jeeps and Harleys are around £40 - £50. I’ll need to see the beam pattern on dip before I part with any cash. None of the adverts I’ve seen so far show convincingly compliant low beam patterns. Conversations with suppliers are under way. #29 Re: After market LED lights. Legal UK? Not only remember them but still have them fitted to my Rover P6.